What Does Nutsedge Look Like? Nutsedge, also known as nut grass, is a weed commonly found in lawns during the summer. These weeds stand taller than the grass in your lawn and are notoriously hard to get rid of given their immersive root systems. Nutsedge is a perennial sedge, meaning it is a grasslike plant that will live for at least two years and will come back year after year. 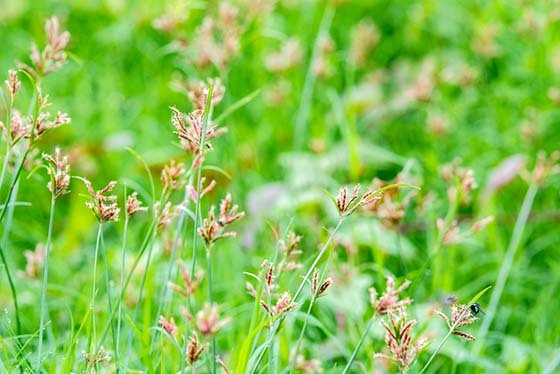 Use this guide to identify nutsedge in your lawn. Then, read the rest of our 4-part guide to learn how to get rid of nutsedge and where nutsedge grows. 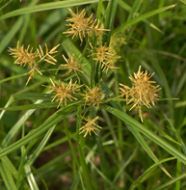 Nutsedge is easily identifiable from grass because it is taller than grass. 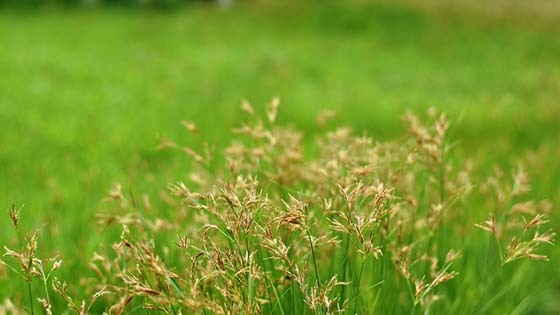 Nutsedge grows much quicker than grass, even after being mowed. Nutsedge weeds, like all sedges (grasslike plants), have a triangular stem that can be felt in your hands. The stem of the sedge feels like it has 3 sides or 3 points, much like a triangle. Nutsedge looks like long grass blades. At the end of a nutsedge stem, you will commonly find 3 leaves and flowers. The flowers can be different colors but are most commonly yellow or purple (dark red). Yellow nutsedge, or nutsedge with yellow flowers, often grows in the middle of the summer while purple nutsedge (nutsedge with deep red or purple flowers) grows in the late summer. 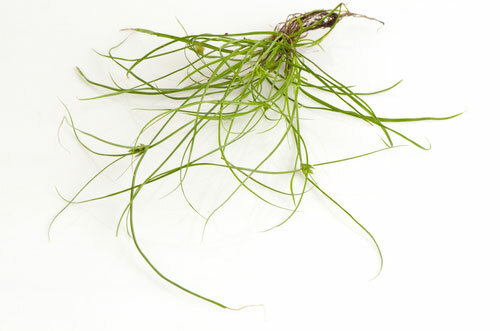 Nutsedge is typically identified by its root system. Nutsedge has roots, called rhizomes, that can reach 8-14 inches below ground. 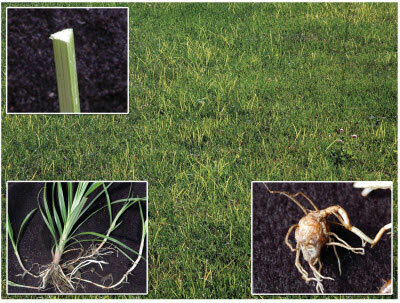 Rhizomes will grow horizontally under the soil and emerge out of the soil to form a new sedge plant. This means multiple sedges may be connected by one series of rhizomes. The roots will also have small, starchy tuber structures (known as "nutlets") attached. If you see nutlets in the roots of the plant, you know for certain you have nutsedge. Nutsedge weeds grow during the spring and summer and are perennial, meaning they come back year after year. Do you have nutsedge in your yard? 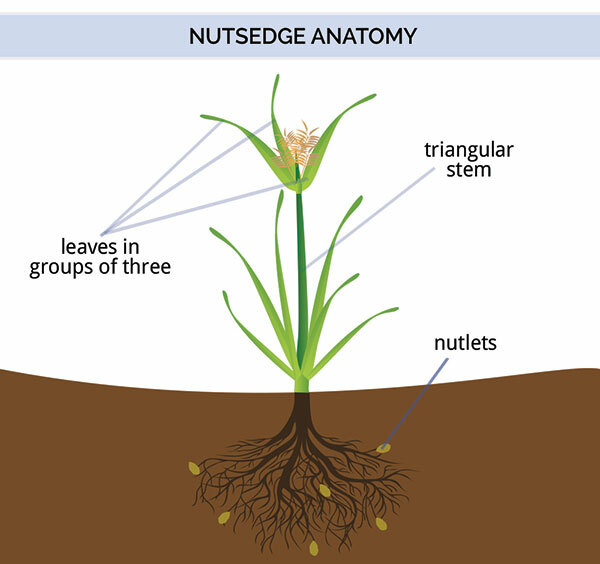 Learn where nutsedge grows in the next part of our 4-part guide. Click the arrow below to read more. 618 of 638 people found this article informative and helpful.